← Fell Off the Wagon, and it Hurt! I created a list of books I’m reading, or plan to read, on Amazon – Treating Multiple Sclerosis Naturally. I got the idea from LinkedIn, where you can incorporate an Amazon.com reading list into your profile. Unfortunately, the feature is exclusive to LinkedIn. You can setup your own list on Amazon using the Listmania! feature, and can then grab a shareable link. I’m sharing my link in the menu on the right side. After my diagnosis, my husband came across a seven-part series on YouTube featuring Loren Cordain, author of The Paleo Diet, speaking to an audience about the diet in relation to Multiple Sclerosis. He goes into detail about how dairy, gluten, and nightshades negatively affect us. He packs a lot of information into his presentation, so it’s probably worth watching a few times. I know I need to watch it again! This entry was posted in Multiple Sclerosis and tagged Dairy, Dairy Free, Gluten, Gluten Free, Gluten-free, Nutrition, Paleo, Paleo Diet, The Paleo Diet: Lose Weight and Get Healthy by Eating the Food You Were Designed to Eat. Bookmark the permalink. Alahnna, While I have no desire to disagree with you, I am worried about those who eat red meat when they have MS. Unfortunately, the “protein buzz is a bit of a high and makes folks feel good just as coke can, but it causes longer term problems that catch up with folks over the years. Eating red meat is something like taking drugs–feels good but has some bad, bad side effects over the longer term. Good luck. But please be careful and check out the problems with red meat. 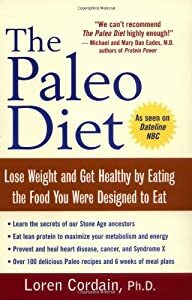 Hi, you might be interested in reading the following: http://intelligentguidetoms.wordpress.com/2012/04/09/some-versions-of-the-paleo-diet-may-make-your-multiple-sclerosis-worse/ . I personally eat whole plant food and fish and very rarely some chicken or turkey breast (I eat chicken or turkey only a few times a year). In any event, I wish you the best. You will do a lot better eating ultra healthy than not. The animal and diary fat is “the worst” as the article explains. Take care and be well and prosperous! Am still rushing too much! LOLLOL. How about “meant” rather than “meat”. Oops! I should not write comments when in a rush. Oops, excuse the typo. I’m in a rush. I meat to type “diet” not “idet”. I have not seen folks following the Paleo diet do all that well with MS. I have seen folks following the idet recommended by medical professor George Jelinek, M.D. do much better. Unfortunately, the Paleo diet has too much saturated fat for those with MS–and especially too much fat from animals. The research shows that animal fat seems to help cause MS. Thank you for your comment Rebecca. I certainly wouldn’t advocate eating high fat animal meat to anyone, and I’m not sure the Paleo diet does that. I think some people may be using it is an excuse to eat the meats they love, like bacon (who doesn’t love bacon? ), as people did the same with the Atkins diet. I don’t feel good when I eat gluten, so I can’t follow Jelinek’s recommendations. If people with MS are doing fantastic while eating gluten, then I would propose it is proof that these different diets or food plans are not one-size-fits-all. Having said that, as a result of the research I have done, I have come to believe that gluten is not good for anyone (nor is dairy) and its effects are experienced differently from person to person. The search for what works best for me led me to Terry Wahls, also a medical professor and clinical researcher. Her recommendations align best with what is right for me and my body. The one-size-fits-all method of treatment is a dangerous path for alternative medicine, one that should be avoided at all costs. It is important to look at research results and the actual outcomes of different approaches. The “one-size-fits-all” criticism is an standard response to skepticism about something such as the Atkins or Paleo diets. Unfortunately, at this time, the research just doesn’t seem to support the view that the Paleo diet is the way to beat MS. I hope you do well on the Paleo diet but I am worried that you may not. I hope you have regular MRI’s so you can monitor your lesion activity. Also, please keep in mind that Wahls’ experience can be explained by a lot of things other than the Paleo diet and that the one little study she has done has not shown great results. It is best to keep an open mind about these things. Please remember that there while Wahls’ is a professor of medicine there are many professors of medicine who disagree with her. When I eat vegetables, lean meats, and fruit, I experience mental clarity and feel the best I’ve ever felt. I don’t care what diet that is called! It works for me & that is the only thing I can recommend to anyone–to learn what works for him/her. What works for one person may not work for another. Just like the drugs used to “treat” MS.